The following recipe is adapted from the November 2011 issue of Bon Appetit magazine. If you want to try their original recipe, you can find it here. For my adaptation, I followed their directions closely, but changed the ingredients as I found the original recipe was a little sour/bitter. Nothing that tripling the amount of sugar couldn’t fix! 🙂 I picked this recipe, because I wanted to try a lighter green veggie recipe this year. Normally whatever green vegetable we serve at Thanksgiving is soaked in cream (think: creamed spinach) or high in fat (think: asparagus wrapped in bacon). I was kind of shocked by how much dressing was coating the green beans when I followed the recipe amounts, but was very pleased that the green beans were still crispy and not soaked in dressing, despite sitting in our warming oven for 1.5 hours before dinner was served. If I were to make this recipe again, I would likely halve the amount of dressing used so the green bean flavor could come through even more. The recipe below is exactly what I made on Thursday. 1. Boil a medium sized pot of salted water. 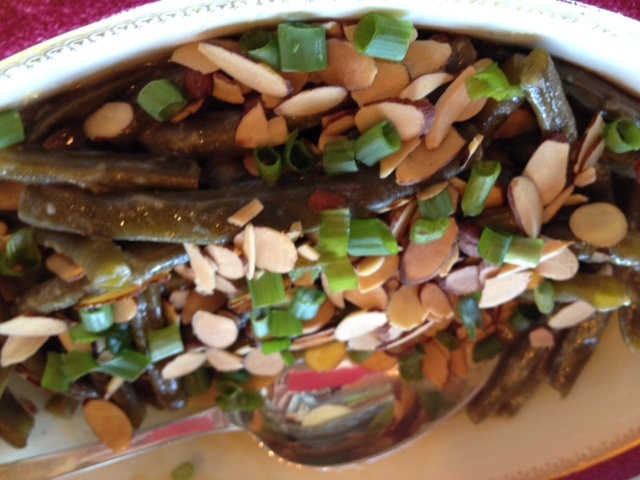 When the water is boiling, toss in the green beans and cook until crisp-tender (about 7-8 minutes). 3. In a small bowl, whisk miso, 2 tbsp. scallions, vinegar, mustard (and water), oil and sugar. Season dressing to taste with salt. 4. 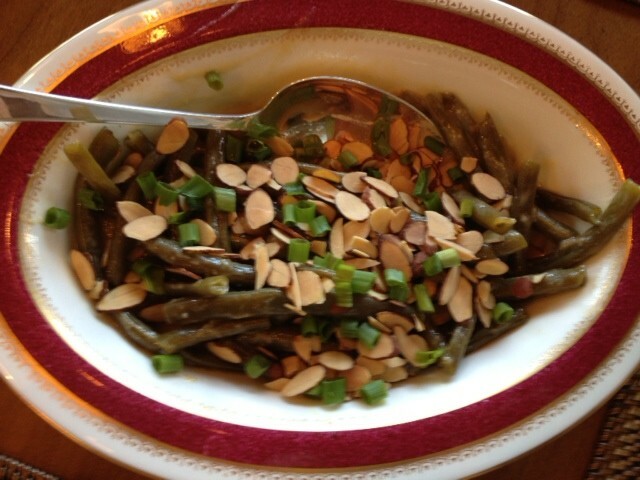 Place green beans in a serving bowl. Pour dressing over; toss to coat. 5. Pre-heat oven to 350 degree. On a baking sheet, lay out flat sliced almonds and toast until they are lightly browned. This should take about 15 minutes. 6. 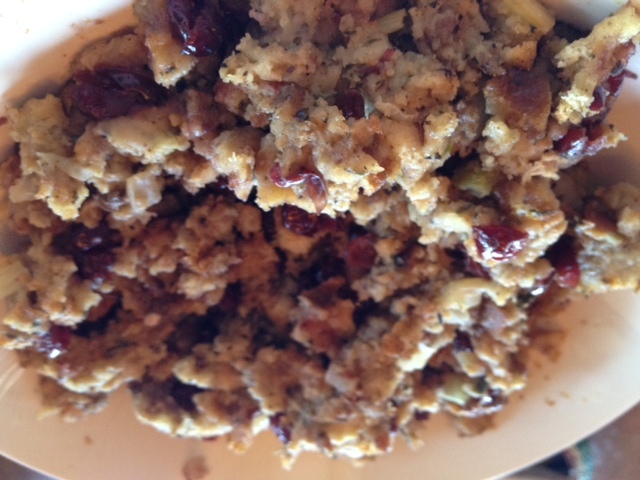 Right before serving, garnish dish with toasted almonds and remaining 1 tbsp. scallions. Serve warm or at room temperature (I prefer warm). Note: After completing step 4 above, I put the green beans in our warming oven for 1.5 hours until the turkey was ready. I did steps 5-6 immediately before we sat down to eat. My Mom started making this recipe a few years back. 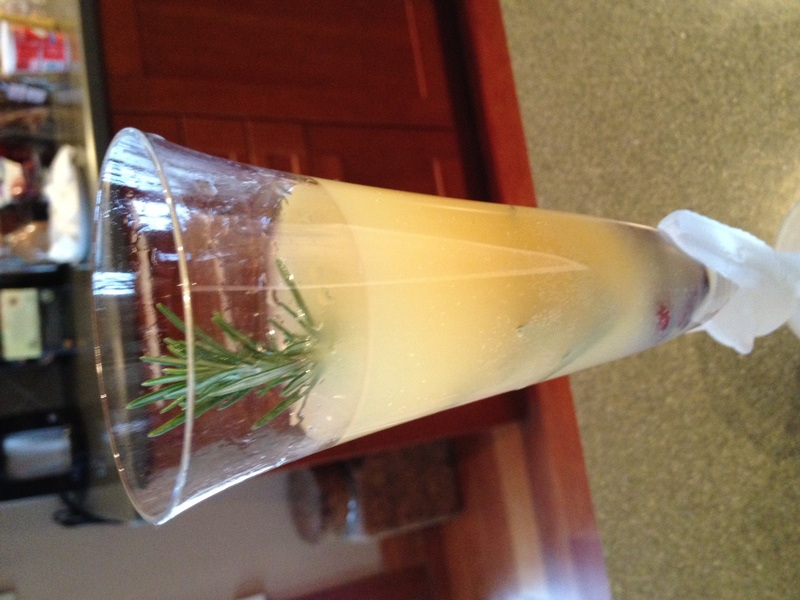 It’s a great seasonal twist on a traditional bellini; adding with rosemary and cranberries as a garnish makes this cocktail even more festive for this time of year! 1. Pour ~2 oz. pear nectar into a champagne flute. 2. Slowly fill glass to top with ~4 oz. prosecco. The following recipe is adapted from the November 2011 issue of Bon Appetit magazine. If you want to try their recipe, you can find it here. 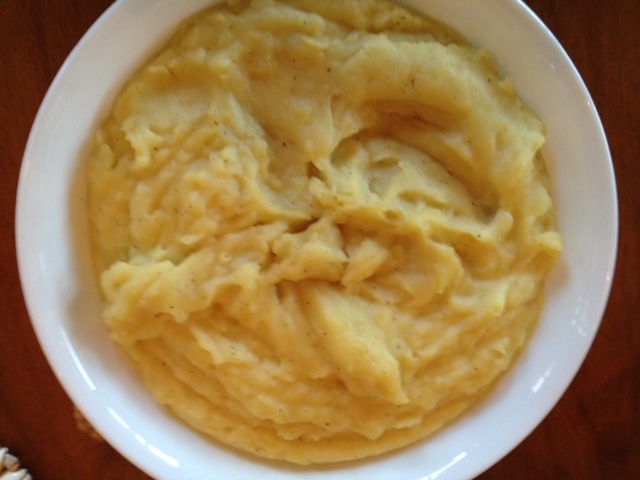 I kept BA’s directions, but changed the ingredients a bit: I flipped the ratio of russet to Yukon Gold potatoes as I find that Yukon Golds make creamier, more flavorful mashed potatoes. I also used half & half instead of whole milk and heavy cream. (This wasn’t by choice, but because we forgot to get whole milk and heavy cream at the grocery store – whoops!) Half & half worked great though and I will continue using it when I make this recipe again. The other thing I did was despite halving the amount of potatoes used, I kept the amount of liquid the same. This resulted in the perfect consistency and also helped the potatoes stay creamy for leftovers for a few days. The real secret to what makes these mashed potatoes the creamiest, fluffiest potatoes you’ve ever tried is a food mill. I used an OXO Good Grips Food Mill to “mash” the potatoes. It was more of an arm workout than I bargained for on Thanksgiving, but it was worth it! Here is my adaptation of BA’s recipe below. 1. Fill a large pot halfway with cold water. 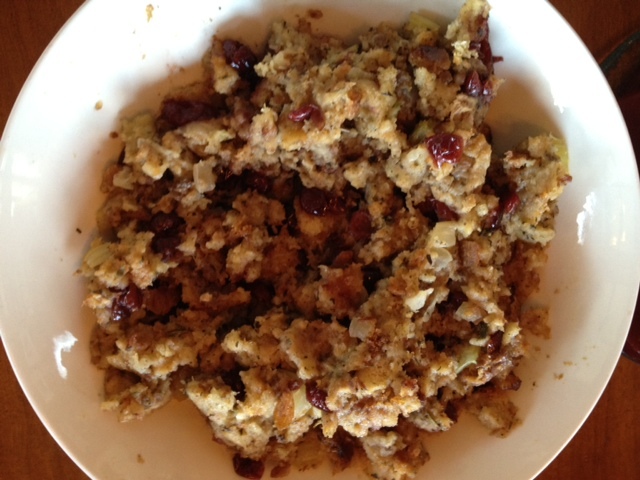 Peel the russet and Yukon gold potatoes and cut into 2″ pieces, adding to pot as they are cut. Add cold water to cover by 1″ if needed. Stir in kosher salt. 2. Bring to a boil, then reduce heat to medium-low and gently simmer until tender, about 15 minutes. 3. Drain potatoes and transfer to a baking sheet. Spread potatoes and let dry for 10 minutes. 4. Once you have turned the heat on the potatoes to medium-low, in a separate small saucepan, heat half & half, peppercorns, rosemary and bay leaves over medium heat, stirring occasionally. Do this until mixture is very hot but not boiling, which should take about 10 minutes. 7. Once the potatoes have all passed through the food mill, stir in the hot half & half mixture. Season generously to taste with kosher salt and freshly ground black pepper. 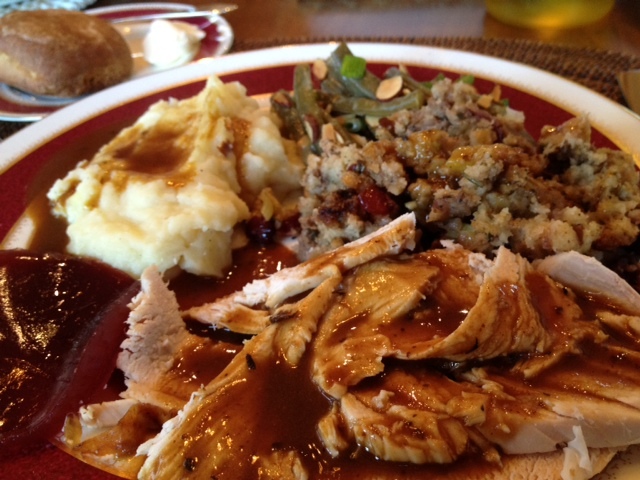 Note: I prepared this dish three hours before the turkey was even ready to carve. In order to keep it warm, I put the potatoes in a double boiler on the stove for two hours and then in our warming oven for the last hour. Happy Thanksgiving! I hope you all had a nice holiday surrounded by family, close friends and great food! Since Thanksgiving is my favorite holiday, I wanted to share with you my family’s recipes from our Thanksgiving feast on Thursday. Over the course of the next week, I will post each of the recipes. To round out our meal, we serve Sister Shubert’s Parker House Style rolls, canned cranberry sauce and Libby’s pumpkin pie recipe using Whole Foods canned pumpkin. I think we will use most of these recipes at Christmas they were all so good! I’m straying from Southern cooking here, but this is my “go to” dinner recipe when I want a home-cooked meal, but don’t have time to follow a recipe or search around the grocery store for a bunch of new ingredients. My friend Kate made this a few years ago at a dinner party she hosted and she was nice enough to share her recipe with me. 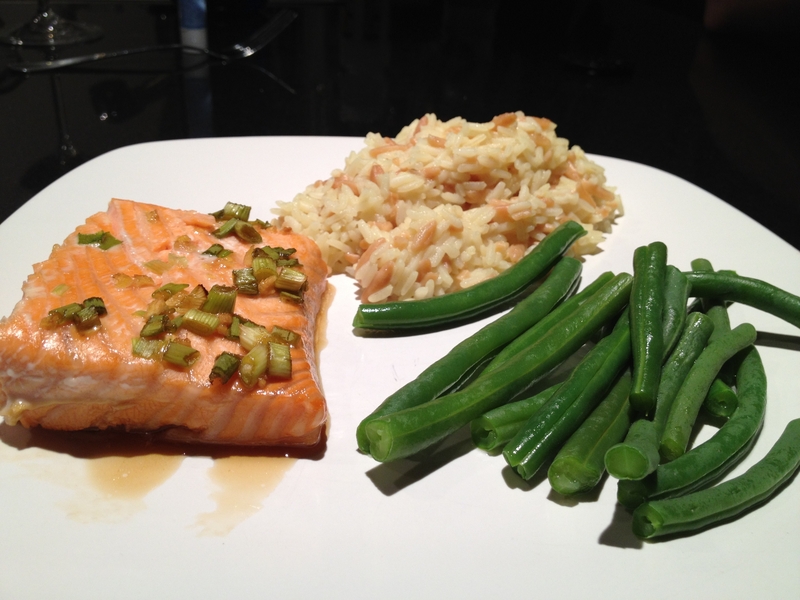 I like serving this salmon with rice pilaf or basmati rice, green beans and a cold glass of sauvignon blanc. This recipe is a true crowd-pleaser. Everyone I’ve made this for comes back for seconds (and thirds!). 2. Place salmon skin down in a baking dish. For easier clean up and to keep the skin from sticking to the bottom of the pan, line the pan with tinfoil. 3. Mix vinegar and soy sauce. Add honey while stirring vigorously so it mixes evenly. Add ginger and scallions last. 4. Spoon/pour mixture onto salmon in pan. Be sure to coat the entire fillet evenly. 5. Bake at 350 for 20 minutes or until salmon has turned a light, opaque pink and easily flakes with a fork. A few weeks ago, I purchased Whitney Miller’s new cookbook called Modern Hospitality: Simple Recipes with Southern Charm. I can’t wait to try out so many recipes (fresh fruit and granola tarts, bacon stuffed brusselsprouts, jalapeno cornbread, the list goes on!) One recipe that immediately caught my eye was Banana Mousse Trifles. It looked so light and fresh; the perfect end to a meal of hamburgers cooked on the grill with sides of scalloped potatoes and cucumber & tomato salad. Since we were entertaining and I don’t necessarily have the patience to make pudding from scratch like Whitney’s recipe called for so I improvised and used store-bought instant pudding. No one could tell in the final taste test and the dessert was a smash success! Here’s my adapted recipe below. Enjoy! 1. Cook pudding in stovetop according to package instructions. 2. After pudding has cooked, cool for 5 minutes then pour into a bowl and store in fridge for 3-4 hours prior to serving. In order to prevent the “skin” from appearing on the top of the pudding, cover the bowl with a lid or saran wrap if you don’t have a lid that fits it. 3. Right before you want to serve the parfaits, crush around 30 vanilla wafers until they are in chunky pieces. (I put them in a plastic bag and then used the back of a spoon to break them up.) Set the crushed wafers aside and take the two very ripe bananas and mash them with a fork until they are broken into small, mushy pieces. Add the juice of half an orange to this mixture to prevent browning/discoloration. Set aside this mixture and slice the remaining two yellow bananas into bite size pieces. 4. In serving glasses, spoon two layers of each ingredient in to a glass in the following order: 1) 2 heaping spoonfuls of pudding, 2) small layer of mashed banana/orange juice mixture, 3) small layer of crushed vanilla wafers, 4) a few slices of banana. Top each parfait with one slice of banana and one whole vanilla wafer. 5. Serve immediately. This will hold up in the fridge for a few hours if you want to prepare it in advance and serve ice cold.